Recently, the 3rd Infantry Division redeployed after 15 months in Iraq and a few units that were deployed to Afghanistan. 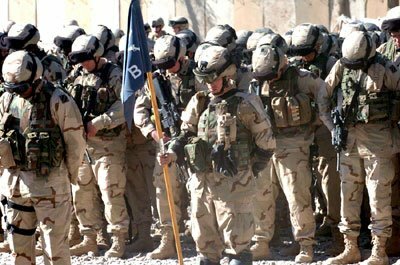 It made me think about my feelings when those same units redeployed after OIF3 rotations in 2005 — which had been particularly difficult. I reflected on the previous 10 months and I realize now from my continued participation on a number of private forums for mothers and families of those deployed, that my feelings were the universal feelings of mothers everywhere — no matter when their child had deployed. And I know mothers who are awaiting the next deployment of their sons and daughters and, although the violence is down and our military and the Iraqis have made spectacular progress, the worry has not changed. For those mothers who are perhaps awaiting the first deployment of their child, here’s what it’s like. I have never been to war but I have sent a child to war. People — especially other mothers that do NOT have children in the military — tell me that they can not imagine what that would be like… that they would be a basket case 24 hours a day. Yes, that’s it. It’s like you live standing on your tippy-toes every day your child is away… and you live on the edge of breathlessness… a mental asthma attack gasping and gasping for strength and sanity and peace of mind. On the outside, we smile bravely and say, “you find the strength.” And, yes, we do find strength, but the truth is that we really only find distractions from our worry, our anxiety, our heartache. We go to jobs. We try to maintain some semblance of our lives, but those lives have changed. And we blog. We write letters. We send cards. We shop for things to send our soldiers. We pack things for our soldiers. We stand in line at the post office to mail things to our soldiers. We talk about them. We live for the opportunity to talk with them. Then we talk to others about what we talked about with our soldiers. And we wait for another chance to talk to them again. We learn to use all the technology available to stay in touch and to try and keep track of them. We listen for our computers to make odd noises when our soldiers are online. We listen for our phones… for the special rings we have programmed so we know if we have to answer that call. We forward phones; we pull to the side of the road to text message back to our soldiers; we give up our place in grocery store lines to run outside so the reception on the phone is better when they call. We get used to the smiling stares from people when we say, “I’m sorry, I have to take this call… my son is calling from Iraq.” And we wouldn’t care if they did mind — we’re taking that call no matter what. We check newspapers and websites for pictures of soldiers from our soldier’s unit in the hope that he might be in one… Never mind that the picture might be days or weeks old, it is at that moment proof positive that our soldier is just fine and he’ll call any time now. We talk or email other parents. We wonder what they’ve heard. We offer support when they’re down (and we all get down) and we call when we’re down ’cause we know they understand completely. We trade jokes, we trade information, we even trade recipes. We think about our soldiers day in and day out. And not just the soldiers we’re related to — but all the soldiers we know in their units and don’t know in their units. When we wake, we calculate the time in Iraq and wonder what they’re doing. It’s a task we’ll do many times every day. When we’re sitting to dinner, we wonder what they had to eat today… wonder if they even got a hot meal today. They’ll pop up in our heads while we’re doing dishes, walking to our cars, doing laundry. We pray for our soldiers. We pray to keep them safe, we pray for their wounds to be healed when they are wounded, we pray for their souls when they die, we pray for the ones left behind to mourn. We pray for the parents in Iraq, and for their children who are now soldiers, too… and for those children protected by the soldiers there. We pray for peace. Every minute of every day we pray for peace and for our children to come home. We cry. We cry when they haven’t called or written and we cry when they do. We cry because we miss them and because we are so frightened for them. We cry when they leave and when they return and then leave again… We find that the smallest of things make us teary-eyed… walking in their room… seeing a picture… seeing a soldier. Watching the news, reading the news, hearing the news. Yes, we cry. There’s nothing like a good cry to set your head straight. Our soldiers get used to it — they don’t understand — but they know it just is. Although we send one child (and my heart knows no limits to the compassion I feel for those mothers with two or more service members in the war! ), we adopt many more… and eventually ALL soldiers — every soldier, sailor, marine, airman — become our sons and daughters. We can not see a soldier anywhere without approaching them and thanking them and telling them that we, too, have a soldier…. because we all know that all soldiers have the same blood and speaking with that soldier makes us feel like we are talking to our soldier. We hug them if they let us — and we hug them whenever we can. And we know somewhere there is a mom thanking us for taking the time to talk to (and for hugging) her soldier. She would do the same for me. If we can not speak to that John Doe soldier, we smile wistfully… we get a pang… and our eyes may fill with tears knowing that when we look at that soldier, we are looking at our own soldier. Ask any soldier’s mom — she’ll tell you… It’s a universal response. And mixed with this fear and longing is pride. Indescribable pride for these children of ours. Pride that they made the choice to serve. Pride that they accepted the challenge and met it spectacularly! Pride that they do their jobs under the most extraordinary of circumstances. We often ask ourselves, “Did I raise this person?” “How could I have done things so right?” We know we are blessed to have these spectacular creatures in our lives. And for the soldiers who have fallen and for their families, we will BE THERE. We will tell their story. We thank them. We will remember them. We will remember all of them. Always. To our Guys… our Soldiers, our Marines, our Airmen, our Sailors and those that serve with them, we thank you all. We live in Freedom and with Liberty because of you. Copyright 2005 and 2008 Some Soldier’s Mom. All rights reserved. I’m in the throes of the first bit of this. My son just graduated from Army Infantry OSUT and is on leave. He’s not even out of the country and I’m already looking for support, looking for other military parents and moms to talk to. This post hit me like a 2×4, honestly. Especially the part about all soldiers become our soldiers. On our way home from Atlanta and the graduation ceremonies, our plane sat on the runway for a long time to wait out a storm and when we finally got on our way, we were set to arrive almost 2 hours late. Across the aisle from my husband was a soldier we chatted with that was returning from leave and had to report back by midnight. But our new arrival time was too late for the last shuttle to Fort Lewis. He would have to be late and his fiance was frantically trying to find a solution (from Ohio) via cell phone. We told him we’d drive him to his base. I think he was amazed that strangers would go to the effort. We rushed around but we got him to his barracks with about 10 minutes to spare. It felt good. Really good. Maybe someday when my son needs a hand, someone will be around to help him. Thanks InfantryMom !!! I have lost count of the many, many ways other parents have reached out to our sons in the military. From paying for their meals, to paying for their cleaning while still in rotc in college, to being there to pin on Airborne wings to helping a bruised son into a first class seat for the trip home. Everywhere they go they tell me, “mom, people are so appreciative, and want to help.” Thank you to all the patriotic mean and women out there who offer cold drinks, meals, help and encouragement when our Air Force son has funeral duty. And I am so proud and grateful for our neighborhood getting behind the local Armory and giving them a great send off last week. And thank you to those two ladies at the post office last week sending hundred of boxes of goodies to soldiers in Iraq. She said their church filled the boxes. And thanks to all who go to the airport and greet the troops. Well Some Soldiers Mom, you did it again. You hit the nail on the head. As I left work today, the car radio was reporting two soldiers killed in Iraq and my I held my breath until I heard where it happened…not in my son’s area, thank God. War makes us a little crazy. While I am glad it was not my son, it was someone else’s child and that just hurts. Hopefully, by Christmas, my own personal war of waiting will be over. Thanks for saying it so well. Once more you have brought me to tears. My son has been to Afghanistan and is preping to go back.It is, as you said, one of the hardest thing we Mom’s do…. Standing there waving good bye to our children. thank you for putting my feelings down on paper. I think you’ve said it as well as any of us could – Thank you…..
A comment from a mom – via RSS Feed. don’t forget, click on the LINK, not Reply! I just wish that I had found this site when #1 Son was deployed the two times. Now I have all my sons back on the Mainland (at one time one was in Hawaii, when not in Afghanistan and one in Belgium with NATO). But am glad that I have it now and can pass it on to other’s with their sons/daughters in harm’s way. I know that I’m not the only Army Mom out there going crazy worrying about their child, whether still on US soil or being abroad thousands of miles away. I have prayed for all of them alike. No matter what Military Branch, they are all doing the same, serving their country, and protecting the FREEDOM of all American citizens. My son is 22 and serving his 2nd. tour in Iraq. I am very proud of him. He wanted to be a soldier ; as was both sets of his grandfathers and great-grandfathers, and all of his uncles. I pray that all of your children come home safely. My son is to come home late september for a two week leave (been in Iraq since March). He wants to surprise his Pap for his birthday. My son was born the day after his 49th. I have two sisters now who will experience my worry as a mom. Both of their sons are due to deploy to Iraq, one in November, and one in January. Thankyou for listening. All of you take care. God bless. Today is a terrible day as you can see on my blogspot. I am just looking for some people that could understand. I enjoyed looking over you spot and will be checking back again. Robin,I too just discovered this web site, I have a feeling that I will be here often. My son is in the army and getting ready to deploy to in November. I agree with all of the moms it is quite scary. I try to remain postive but it is really hard sometimes. I have been very grateful for all of the support my son has recieved in the last couple of years. Most of the time I not only worry about my son but just feel that I wish I could do more for other soldiers. Recently while visiting one of the bases, that has had numerous deployments I relized what so many people do not see. That is the fear that families go through everyday. So, my prayer has since not only been for our soldiers but the families that so often feel helpless. This was very, very good and definitely brought the tears to my eyes…I’m also just at the very beginning of this journey, my son is getting ready to start Army Infantry OSUT and I am so proud of his choices but also so worried cause I’m his Mom. Sure I will be needing support throughout this new journey of his and mine.